MADERA, CALIFORNIA (September 30, 2017) – The 5th annual Short Track Shootout for $10,000 to win at Madera Speedway on October 7th has attracted its largest entry list of RPM Mortgage Pro Late Models, with nearly 60 cars already confirming tentative registrations. The 150 lap race to be broadcast on MAVTV is joined by the championship finale for the 51FIFTY Energy Drink Jr. Late Models, Lucas Oil Modifieds, and Mini Cups. More than 400 laps of racing will take place on the fastest one-third mile in the west. Not only will the Pro Late Model race for $10,000 to win, but the B Main will pay $1,000 to win as well! Former K&N West champions Mike David of Modesto and Eric Holmes of Escalon have dominated the Short Track Shootout. David won the inaugural running while Holmes has taken on the “Mr. October” moniker with three consecutive victories. This year’s event may be the toughest test yet, however, with the race expanded to 150 laps. 2015 Pro Late Model champion Buddy Shepherd leads the 2017 series into the race that serves as its season finale as well. 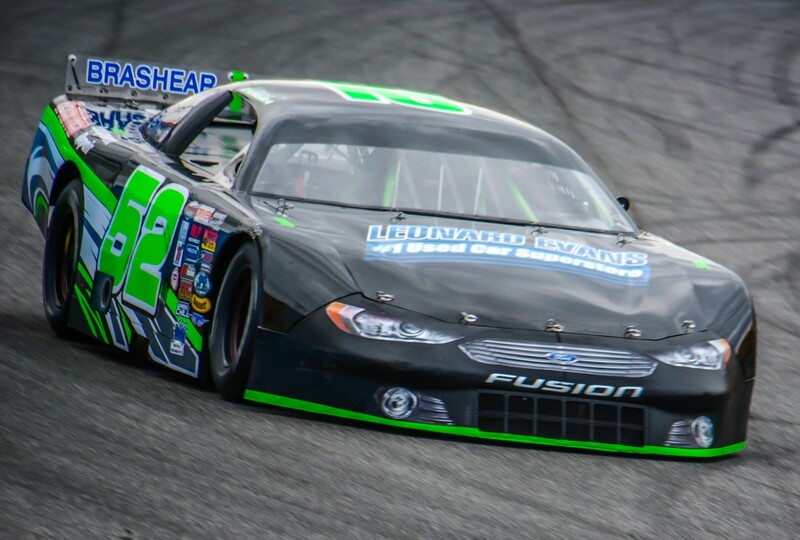 Shepherd had been snake bitten by big money races before he won the 125 lap, $5,000 to win “Summer Speedfest” on July 29th. Shepherd hopes to seal both the series championship and his career’s biggest win at the Short Track Shootout. 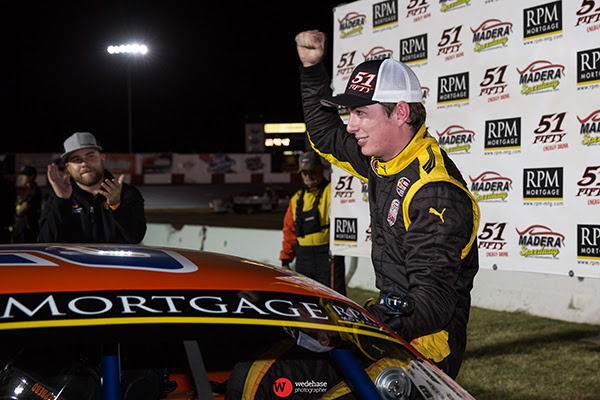 Napa’s Logan Zampa, second in points, and Madera’s all-time winningest driver Matt Erickson also would like a taste of a five figure pay day. The attention the race has attracted from Southern California is notable with 2017 NASCAR Whelen All-American Series national runner-up Trevor Huddleston anchoring a three car High Point Racing assault on the event. Jager Jones - grandson of the legendary Parnelli Jones -along with national top-ten driver Dylan Garner round out the team’s potent lineup. Veteran Nick Joanides finished third in the 2017 Irwindale points and returns to the Short Track Shootout while fifth in Irwindale points Lawless Alan is making his maiden voyage in the 150 lapper. Late Model rookie Ryan Schartau and veteran Rodney Peacher round out the Irwindale onslaught. Irwindale Spec Late Model champion Robby Hornsby is also expected. Northern fans will be well-represented too with Canadian Geoff Morris and Idaho transplant Doyal Moen entered. The Pacific Challenge Series’ winningest driver Jeremy Doss, with 19 career victories and two championships, will return to Madera after winning the August round of the RPM Mortgage series. 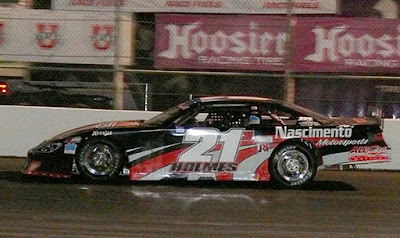 Doss ran track record times in practice in last year’s Short Track Shootout but did not run the feature. Third generation driver Ross Strmiska and touring star Blaine Rocha also add to the spice. 51FIFTY Energy Drink Jr. Late Model rookie Hailie Deegan is slated to make her first Pro LM start in a big test for the young lady driver. 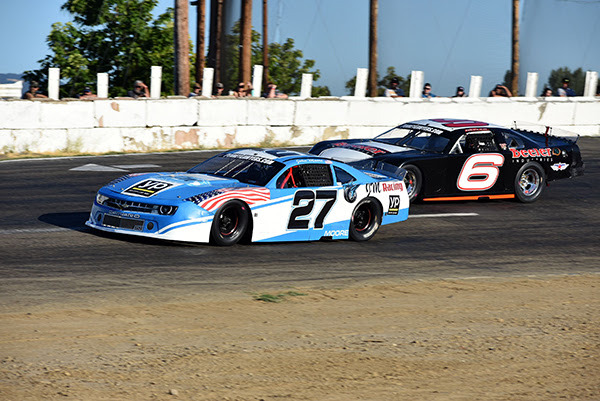 The balance of the entry list is nearly every driver who has made a 2017 Madera start in either the televised races or the eight race Madera Late Model non-televised series. More than 40 local drivers will test their mettle in the one of the most prestigious races in America. This includes 2007 Altamont champion Ryan Philpott, three-time ASA Speed Truck champion Joey Licata, Jr., multi-time Madera champion Rick Thompson, four-time MST track champion Kevin Thompson, and many many more. An open practice kicks off the weekend on Friday before a full day of action on Saturday. Friday practice runs from 3 p.m. - 8 p.m. On Saturday, pit gates open at 9:00 a.m. with practice from 11:30 a.m. - 1:30 p.m. Qualifying will follow with C Mains and B Mains beginning at 4 p.m. The Mini Cup main will also be during this time. Opening ceremonies are officially at 5:30 p.m. with the 75 lap 51FIFTY Energy Drink Jr. Late Model championship race, 75 lap Lucas Oil Modified race, and the 150 lap Short Track Shootout for $10k to win for the RPM Mortgage Pro Late Model Series to follow. Tickets for Madera’s biggest race of the year are value priced at just $15 for adults, $13 for seniors and military, $7 for youth ages 6-12, and kids five and under are free! Wenatchee, WA (October 29, 2017) It was an under 21 podium at Wenatchee Valley Super Oval for the 4th Annual Neal Newberry 125. Young guns Brittney Zamora, Jan Evans, and Brooke Schimmel crossed the stripes 1-2-3. Zamora has had an outstanding follow up season to her Jefferson Pitts Rookie of the Year in 2016. Graduating from high school with honors, performing her final dance recital, starting college at Washington State University, two NWSLMS wins, as well as podium finishes, and a championship have highlighted her summer. Second generation driver, Jan Evans knew he had his work cut out for him in the final event for 2017. Coming into the night third in points, and first in Jefferson Pitts Rookie of the Year points, Evans held a mere four-point lead over his closest competitor Brooke Schimmel. The sixteen-year-old Evans qualified in the fifth position, and started the main event in the second row. Early in the race, Evans got together with Clint Habart who spun. Evans was posted for the contact and restarted from the back of the field. Climbing up to thirteenth, Evans was again involved in an incident, this time with Christopher Kalsch. Once again relinquished to the rear of the field, Evans needed to regroup and focus on making his way through the field. By lap 86, he was back to the seventh position. By lap 110, Evans had caught Schimmel in third. After a heated battle, Evans got to the inside to take the position. Schimmel tried a crossover move, but was thwarted by a lapped car. Evans continued to chase down the top two. As Zamora made her move, Constance bobbled and Evans was there to take over second. Evans edged ahead of Mitch Kleyn by three points for the second finishing position in the championship standings, along with winning the Jefferson Pitts Rookie of the Year title for 2017. Sixteen-year-old, Brooke Schimmel started the night with a sixth-place qualifying position. From the second row, Schimmel was quick to jump up to second place in the field to do battle with pole setter Braeden Havens. Havens was strong, but Schimmel took over the lead on lap fourteen. Opening a big lead on the field, Schimmel looked poised to take win number three of the season. Brushing the front stretch wall on lap 36, Schimmel spun by herself going into turn one, handing the lead to Chad Holaday, who had moved into the second position. From first to seventeenth in the blink of an eye, Schimmel remained unruffled. Making her way back toward the front, Schimmel was back in the top ten by lap 70, and into the top five by lap 100. Schimmel tracked down and passed Alan Cress and Andy Sole to take over the third position. With a mirror full of Evans, Schimmel tried to hold him off, but was unsuccessful. Schimmel finished her rookie season with two wins and fourth place in the championship standings. With a win under his belt at South Sound Speedway this season, Mitch Kleyn was looking to send this season off with a bang. Not the qualifying effort he had hoped, changes to the car had Kleyn’s hopes up for a great finish. Caught up as an innocent bystander in the Kalsch/Evans incident, Kleyn suffered some damage that hampered his efforts. Kleyn recovered to a top ten finish, in seventh position, and third in the overall championship standings. Kleyn is part of the core of the series, and the only driver to have competed in every event in the four-year history of the NWSLMS. Alan Cress, of Stayton, Oregon has competed in seven of the eight events during the 2017 season, making the longest tow to nearly every event this season. Cress started on the front row with Havens. Holding on to third place late in the race, Cress got shuffled back near the end, finishing eighth and sixth overall in the championship standings. With one of the smallest teams in the series, Ed Thomsen has made every event this season. Improvement at every event, you’ll always find Ed and brother Pete with big smiles in their pit. While finishing fourteenth in the event, Thomsen finished a personal super late model best, fifth in the championship standings. The top six championship contenders have put their heart and soul into the NWSLMS. They are the backbone. We’d like to thank the drivers, crew, and their families for their continued support. Plans for 2018 are underway with efforts to be bigger and better. DAYTONA BEACH, Fla. — The NASCAR K&N Pro Series West schedule heads to Meridian Speedway in Meridian, Idaho, for the NAPA Auto Parts Idaho 208 presented by Perfect Hydration and Lights Out on Saturday, September 30. Below is a look at the race itself and some of the selected participants. • Reigning series champion Todd Gilliland of Sherrills Ford, North Carolina, won for the sixth time this season in the most recent event at Oregon’s Douglas County Speedway, to extend his point lead to five points over teammate Chris Eggleston of Erie, Colorado. • Eggleston, himself a four-time winner this season, finished second to Gilliland at Douglas County. • Gilliland is the defending winner at Meridian. • This will be the series’ fourth visit to Meridian Speedway. • Meridian Speedway has been in operation since 1951. • The K&N Pro Series West has had three winners at the quarter-mile oval, beginning with Ray Elder winning the inaugural race in 1972. • After a 43-year absence from Meridian, Noah Gragson won from the pole when the series returned to the track in 2015. • Two Meridian winners – Ray Elder and Noah Gragson – won the race from the pole. • The most lead changes at the track occurred in 2015 with 15. • Todd Gilliland is the defending race winner at Meridian. • Sits ninth in the current series standings with two top fives and six top 10s in 11 starts. • Finished a season-high third at Washington’s Evergreen Speedway in August. • Finished third last season at Meridian in her second series career start at the track. • Sits second in the overall K&N Pro Series West standings, just five points behind leader Todd Gilliland, with four wins, 10 top fives and 11 top 10s in 11 races. • Has nine career K&N Pro Series West wins with 29 top fives and 33 top 10s in 42 career starts. • Is the only driver to finish in the top 10 in every race this season and has wins at Tucson (Ariz.) Speedway, California’s Orange Show Speedway, Colorado National Speedway and Evergreen. • Leads the West with top fives in 10 of 11 races this season. • Has a career-best finish of fourth in two starts at Meridian. • Has six wins, eight top fives and 10 top 10s in 11 West races this season to lead the series standings by five points over Chris Eggleston. • Won the most recent race at Douglas County for his series-leading sixth win of the season. • Won the first five pole awards of the season and four straight races — California’s Kern County Raceway Park, California’s Irwindale Event Center (twice) and Spokane (Wash.) County Raceway. • Won last season at Meridian in his only career start at the track. • Sits third in the current West standings with six top fives and seven top 10s through 11 races. • Won his first career pole at Iowa Speedway, and finished third in the most recent event at Douglas County. • Currently leads the running for the K&N Pro Series West Sunoco Rookie of the Year. • Has never competed with the series at Meridian. • Sits seventh in the overall standings with one top five and six top 10s in 11 starts this season. • Posted a season-high finish of fifth in the most recent event at Douglas County. • Her career-best series finish of second came at Meridian last season. • Despite missing the season opener, is fifth in the standings with four top fives and 10 top 10s in 10 starts. • Has six career K&N West wins, including two at both Minnesota’s Brainerd International Raceway and Iowa. • Ranks a career-high sixth in the overall standings with one top five and seven top 10s in 11 starts this season. • Has five top 10s in the last six races and finished a season-best third at Orange Show, his best finish in nine years. • Has never competed with the K&N Pro Series West at Meridian. • Ranks fourth in the West standings with seven top fives and nine top 10s in 11 races this year. • Is second in the running for the K&N Pro Series West Sunoco Rookie of the Year this season. • Matched a career-best finish of second at Evergreen, giving him two second-place finishes in a three-race span, including at California’s Sonoma Raceway. • Has two career K&N Pro Series East wins at New York’s Watkins Glen and New Jersey Motorsports Park this season. • Monster Energy NASCAR Cup Series driver Kevin Harvick is the only driver other than Gilliland or Eggleston to win a race this season, winning on the road course at Sonoma in June. Eureka, CA (September 25, 2017) – The 2017 season at Redwood Acres Raceway is coming to a close this weekend. Championships in all six divisions are on the line for what will be the 25th running of the Acres’ season-closing weekend tradition which will now be dedicated yearly to the recently passed Dennis Wendt. Mid-City Motor World will be presenting the annual two-day event. The California State And Federal Employee’s Credit Union roadrunners will be running three 20-lap main events this weekend, two on Saturday night and one on Sunday afternoon. Daniel Buell extended his point lead in the most recent race on September 2nd. His lead over Nick Ford is 18 points. In third is Tim Ratzlaff who has a mathematical chance at the track championship but likely won’t be able to advance his position in the standings. There is only a one point difference between the fourth and fifth place drivers, Jennifer Murrell and Bob Ratzlaff. Tyler Peach has a nearly insurmountable lead for the Nor-Cal Automotive Legends. Peach has a 37 point lead over MKinzy Uselton. Going into the September 2nd event, Uselton was within five points of Peach but a heat race incident in the most recent race has more or less extinguished her hopes for the championship. The top five in the standings are Brad Curtice, Dominic Vogelsang and Brett Mack. None of those drivers are in the running for the track title in the division. The second Fortuna Wheel & Brake bomber bash will be a featured attraction for the Fall Spectacular. Duel 50-lap main events are set for the Sunday show. John Lally’s 52 point lead over Kolby Jackson might look like a sizable advantage but with two main events, anything can change. Bethany Rapp is third, one point behind Jackson. Although he is 89 points behind Lally, Jim Redd still has a chance at the championship although his chances are long. Fifth place features a tie between father and daughter, Jimmy Sorrels and Kimberly Sorrels. After playing catch-up all season long, Brett Murrell has the points lead in the Humboldt Hydroponics mini stock division. He still has his hands full as his father Brian Murrell, Jr. is one point behind in second. Eugene Palmer is third and is right in the thick of the running only six points behind Murrell. The top five is rounded out by two drivers who have had very impressive rookie seasons. Scott Taylor is 23 points behind the leader and still has a chance at the mini stock title. Trevor Eacret is fifth but is 41 points behind Taylor. The Lone Star Junction Thunder Roadsters is the only division that will be running a full slate of trophy dashes, heat races and main events on both Saturday and Sunday. Nine points is the margin between first and second Ronnie O’Neil and Tommy Payne. Chris Lawrence is third and will likely finish the season in that position barring major issues for O’Neil and Payne. Mac Collado is a veteran racer at the Acres but is a roadster rookie. He sits fourth in the standings. Paul Peeples, Jr. completes the top five. Mic Moulton holds the points lead for the Mid-City Motor World late models. 13 points behind in second is Eric Gannon. Marty Walsh is three points behind Gannon in third. Brandon White in fourth is 26 points behind Moulton while fifth place David Henderson is another point behind White. They are the only drivers in the division who have a chance at the track championship. While this weekend’s 100-lap late model event will crown the track champion for the division at Redwood Acres Raceway, it will also be the first race of the two-race playoff for the overall champion of the Super 6 Late Model Challenge Series. The championship deciding race will be held at Ukiah Speedway on October 21st and 22nd. To qualify a driver had to attempt to start all six previous races in 2017, had to win a race, or had to qualify through earning the most points of non-winners. Moulton, Gannon, White and Henderson were able to solidify their positions with wins while Marty Walsh and Ryun Leazer earned their chance through points. 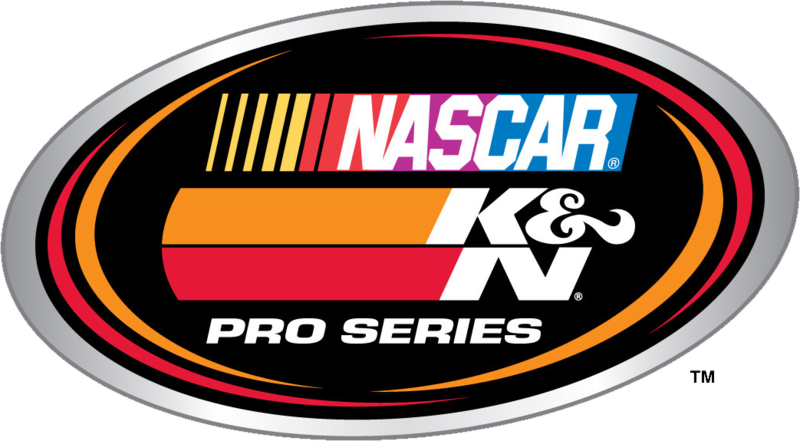 DAYTONA BEACH, Fla. — The NASCAR K&N Pro Series West enters its stretch run with the NAPA Auto Parts Idaho 208 presented by Perfect Hydration and Lights Out at Meridian Speedway in Meridian, Idaho, on Saturday, September 30. With just three races remaining, it has turned into a two-horse race atop the field as Bill McAnally Racing teammates Todd Gilliland and Chris Eggleston have locked into a season-long battle that is coming down to the wire. Gilliland, the defending series champion, has a series-leading six wins through 11 races this season and leads Eggleston — a four-time race winner this season — by five points as the series heads to Idaho. Last season, Gilliland used the Meridian stop as a way to cement his championship aspirations. He won the race, while his closest title pursuer, Ryan Partridge, finished 11th. Gilliland left the weekend with his point lead at 25 — nearly double what he’d entered with. Eggleston finished ninth at Meridian a year ago, and he’ll certainly try and improve on that to close the gap on Gilliland. EVENT SCHEDULE: Saturday, September 30 — Garage opens: 12 p.m.; Practice: 2:45-3:30 p.m.; Final practice: 3:45-4:30 p.m.; Qualifying: 5:30 p.m.; Driver autograph session: 6 p.m.; NAPA Auto Parts Idaho 208 presented by Perfect Hydration and Lights Out: 8:30 p.m. The Race: The NAPA Auto Parts Idaho 208 will be the 12th of 14 races on the 2017 NASCAR K&N Pro Series West schedule. The Procedure: The starting field is 22 cars, including provisionals. The first 18 cars will be determined by qualifying with the remaining four spots being awarded through the provisional process. The race is scheduled for 208 laps covering 52 miles. Race Winners: There have been three different winners in the three previous NASCAR K&N Pro Series West races held at Meridian Speedway. Ray Elder won the inaugural race at the track in 1972, with Noah Gragson winning the series’ return in 2015. Track Records: Noah Gragson holds the track qualifying record at 69.140 mph (13.017 seconds), set in a Ford in September of 2015. The race record also belongs to Gragson’s Ford at 39.361 mph (1 hour, 19 minutes, 16 seconds) set in that same event. Quarter Way: The NASCAR K&N Pro Series West has visited only one quarter-mile this season, with Chris Eggleston winning at California’s Orange Show Speedway. A year ago, the series made three trips to quarter-miles, with Todd Gilliland winning twice — including Meridian. Short tracks will be key to the title chase, with all three of the final events of the year being contested on tracks a half-mile or less in length. Double Duty: Gilliland is attempting to become the first driver two win both K&N Pro Series championships — East and West — in the same season. With one race left in the East, Gilliland has an eight-point lead over Burton. With three races remaining in the West, the defending series champion is atop the standings by five points with a series-leading six wins through 11 races this season. Winning Form: While he’s still searching for his first career West win, Will Rodgers has found success on the other side of the continent. Rodgers has two wins this season in the K&N Pro Series East, including that series’ most recent event at New Jersey Motorsports Park on September 16. Rodgers also won in August at New York’s Watkins Glen International. The 22-year-old from Murrieta, California, held off both East title contenders — Gilliland and Burton — to win each of those two races. While Derek Kraus holds a six-point advantage over Will Rodgers in the official rookie standings, the two drivers sit much closer than that in the overall standings. Kraus is third, just two points ahead of Rodgers. Rodgers has more top fives (seven) and more top 10s (nine) than Kraus, though Kraus has finished second on three different occasions this season — at California’s Kern County Raceway Park, Spokane (Wash.) County Raceway and Colorado National Speedway — as he knocks on the door of his first series win. In operation since 1951, Meridian Speedway is home to NASCAR Whelen All-American Series racing, including the Division I Modifieds and the Division II Super Stocks. Race winner, Darrin Sullivan with members of the Lloyd Burton family. September 23, Anderson CA ...... Race #10 of the North State Modified Series, presented by Protect the Harvest, was loaded with action from start to finish, but when it was all over Kelseyville's Darrin Sullivan beat Randy Houston of Medford, Oregon by inches to claim the $1500 first place prize in the 2nd annual Lloyd Burton Against-the-Wind Challenge at Shasta Speedway Saturday night. Earlier Eric Johnson, also of Kelseyville, set a new NSMS track record of 15.935 seconds. Johnson was the only driver to break into the 15-second bracket. The previous record of 15.948 was set in May, 2014, by 2014 NSMS champion Jay Linstroth of Citrus Heights. A 10-car invert for the 60 lap feature placed Oregon driver Rich Cobb and Lakeport's Ian Elliott in the front row over the 21 car field. Terry Deal and Sullivan shared row two, Dustin DeRosier and Houston started in row three, last year's race winner Jason Philpot and current points leader Darrin Knight were in row four, and Charlie Collins was next to Johnson in row five. Cobb powered ahead at the start with Elliott, Deal and DeRosier next in line. As Cobb was pulling away, Deal dove under Elliott for second on lap nine. Philpot swapped places with DeRosier on lap 11. Two rounds later the yellow flag flew when Richie Potts was tagged and spun in turn four. Before one more lap was completed Johnson and Houston made contact for another caution. Johnson was forced to pit for repairs and lost six laps before he could return to action. The double-file restart saw Deal out in front for a half-lap, but Cobb dove into turn three harder to regain the number one spot. Philpot moved to the high side and passed Elliott on 17, and at the same time Sullivan made an inside pass on Elliott for fourth. Knight followed Sullivan's line as Cody Braund lost power, slowed and retired to the pits. Simi Tour and Sierra Furia tangled to stop the action again on lap 25. Furia's car was towed to the pits for repairs but she tagged the back of the pack to take the next green flag. The running order at the half-way marker showed Cobb still out in front of Deal, Philpot, Sullivan, DeRosier, Knight, Houston, Collins, Elliott and Cameron Austin. Three circuits later Sal Lopez spun in turn two, and on the restart Sullivan powered by Deal for second. Philpot ducked under Deal for third the following round. The yellow waved again on 42 when Furia stopped on the track with a flat. She pitted for a tire change and restarted at the rear. Another three green-flag laps ran before both Knight and Collins spun in turn four for yellow number six. Sullivan forged ahead of Cobb at the start to take over the lead. Philpot ran third with Houston passing Deal for fourth on lap 45. Cobb slid up the track slightly opening the door for both Philpot and Houston to fill the hole taking over second and third. Cobb's car got loose and spun on the backstretch for the final yellow, and on the restart Houston dove under Philpot and set his sights on Sullivan. Houston looked high and low, moved his mount to the high side on the white flag lap, pulled along side of Sullivan for a photo finish at the checkered flag. Sullivan posted the win by inches over Houston, Philpot, Deal, and DeRosier. Rounding out the top 10 were Austin, Elliott, Wade Coleman, Potts, and Knight. Sullivan's name will be added to the perpetual trophy as the winner of this event. Wade Coleman earned the Keyser Hard Charger Award plus a $200 bonus courtesy of Mary Burton and Dan Burton's Kaleidoscope Coffee Shop. In addition to the Penney Racing Supply Fast Time Award, Eric Johnson also collected another $200 for his new track record from Brandon Williams of Sunrise Excavating. The $100 Nor-Cal Racing Alumni half-way award went to Rich Cobb. Dustin DeRosier won the Naake Suspension Award, the DJ Safety Certificate went to Charlie Collins, and Adrianna Strugnell got the Racer Bling Award. Scribner Plastic jugs went to Richie Potts and Cameron Austin. Lakeport's Cadillac Pat Sperling donated $100 to Tom Ford for being the first car to retire from the race. The North State Modifieds will finish out their season at All American Speedway in Roseville, CA on October 14. This event, The Sinister Diesel 60, will be part of the NASCAR K&N Series October Classic. The purse and long-tow awards will be increased for this championship event courtesy of Economy Heating & Air of Roseville. The North State Modified Series is presented by: Protect the Harvest, Lucas Oil, Sinister Diesel, Ward Ranches, Penney Racing Supply, American Racer Tires, Naake Suspension, Sunoco Race Fuels, Five Star Bodies, Racer Bling, Keyser Racing Products, Scribner Plastics, DJ Safety, and the Buckhorn Bar & Grill, Economy Heating & Air, and Mort Houston. SUNOCO/PENNEY RACING SUPPLY TIME TRIALS: Eric Johnson (15.935 NTR), Charlie Collins (16.011), Darrin Knight (16.032), Jason Philpot (16.103), Randy Houston (16.122), Dustin DeRosier (16.205), Darrin Sullivan (16.208), Terry Deal (16.356), Ian Elliott (16.403), Rich Cobb (16.406), Richie Potts (16.422), Guy Young (16.468), Sierra Furia (16.487), Cameron Austin (16.512), Aaron Coonfield (16.522), Adrianna Strugnell (16.573), Wade Coleman (16.594), Sal Lopez (16.607), Cody Braund (16.616), Simi Tour (16.636), Tom Ford (16.3848), Rick Avila (N/T). LUCAS OIL DASH FOR CASH: Richie Potts, Cameron Austin, Adrianna Strugnell, Guy Young, Aaron Coonfield, Wade Coleman. LLOYD BURTON “Against the Wind” CHALLENGE: Darrin Sullivan, Randy Houston, Jason Philpot, Terry Deal, Dustin DeRosier, Cameron Austin, Ian Elliott, Wade Coleman, Richie Potts, Darrin Knight, Adrianna Strugnell, Charlie Collins, Sierra Furia, Rich Cobb, Aaron Coonfield, Simi Tour, Sal Lopez, Eric Johnson, Guy Young, Cody Braund, Tom Ford, Rick Avila (DNS). 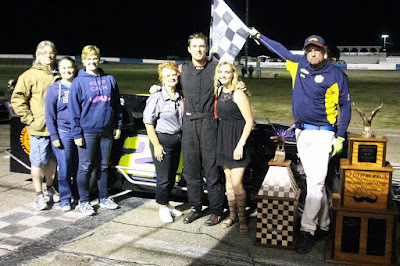 MADERA, CALIFORNIA (September 23, 2017) – Bakersfield’s Buddy Shepherd extended his points lead with his fourth RPM Mortgage Pro Late Model Series victory of 2017 on Saturday night, taking the 100 lap race at Madera Speedway worth $2,000. Shepherd’s win and fast-time gave him critical points in a tight points battle with Napa’s Logan Zampa heading into the Short Track Shootout on October 7th. Racin Vernon drew the pole alongside Shepherd for an all-Bakersfield front row for round #7 of 8. 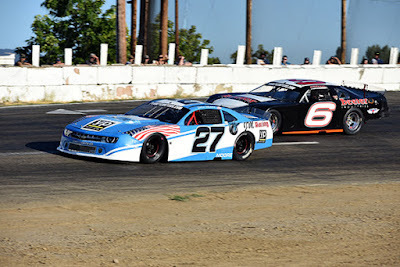 The busy start for the 25 car field saw Modesto’s Garland Tyler from eighth slide around several times boxing out 16 year-old Eric Nascimento, Jr. Nascimento was forced into a three wide situation to fall back to 11th. Shepherd led early while Vernon, Zampa, and third-generation driver Ross Strmiska nearly went three-wide on several occasions for second. Tyler’s loose condition jumped him to the outside which was the preferred line anyhow. Mariposa’s Glen Cook and Jarrett Gilmer battled for sixth with Tyler on the outside behind them. There was racing all over the track as Strmiska took over second from Vernon. Strmiska and Vernon made slight contact in turn two in lapped traffic on lap ten. Strmiska cut down a right rear tire but was saved by a yellow when Nascimento and Oakdale’s Blaine Rocha came together in turn four. Shepherd had a strong restart which allowed Vernon to get outside Zampa for second. Rick Thompson and Clovis’ Trevor Schlundt crashed in turn three right in front of a side-by-side Howard Holden and Shelden Cooper for a lap 18 caution. Modesto’s Kyle Gottula restarted fourth and followed Shepherd on the following restart to try to pass Zampa, but Zampa held on for second. Vernon drifted backwards but was saved by a yellow when Cook spun and collected Schlundt. Both were able to resume. Seemingly a new character emerged for third on every successive restart, with Tracy’s Justin Philpott going around the outside of Gottula and 11th starting Matt Erickson also entered the fray. Gilmer turned around in turn one and sparked a significant crash with six cars stuck together including Mike Shapiro underneath Nascimento. A lengthy red flag resulted although only a couple of cars were actually eliminated from the event. Shepherd lost no momentum when he rocketed away on the restart. A skirmish in turn four ended up with Coarsegold’s William Martyn sideways for another yellow. Erickson used an uncharacteristic inside line to pass both Tyler and Dillon Tucker to assume fifth before sliding back upstairs on lap 40. Cook had a solo spin for a lap 44 caution that ended up being the halfway break six laps early. The field resumed 19 cars strong with Vernon and Erickson colliding for a scare down the frontstretch but both managed to keep going. Zampa had a strong restart at the lap 50 mark but could not make the inside stick, after much of the field reported a tight condition during the break. Erickson and Vernon entertained the fans with a side-by-side battle for many laps for fifth. The race went under its longest green flag stretch which allowed Erickson to crawl up to Tucker for fourth. Erickson threaded the needle on a lapped car to take the spot on lap 75. Vernon, Shelden Cooper, and Philpott put on a good race for the eighth position before Cooper spun down the backstretch for a lap 84 caution. Erickson was able to restart behind Shepherd from the outside of row two but couldn’t chase him down. A lap 85 yellow for Gilmer spun around in turn one gave Erickson another look. Erickson had a much better restart on this try but Zampa managed to slide up in front of him to keep second behind Shepherd. The scramble brought Rocha into the top-five too. The following lap Rocha spun into the turn three wall to set up the final restart of the evening. Shepherd proved too strong as he drove away from Zampa with Erickson narrowly edging Gottula for third. Tyler rounded out the top-five. The series concludes October 7th with the $10,000 to win Short Track Shootout that is expected to attract teams from across the country. Austin Herzog won his sixth career 51FIFTY Energy Drink Junior Late Model race and second of 2017 by taking the 75 lapper. Hollister’s Adam Lemke drew the pole alongside Tanner Reif of Las Vegas against a 17 car field. Lemke edged forward inside to lead lap one as the top 12 cars all ran side-by-side early. His teammate Hailie Deegan nosed inside Reif to battle for second. Danville’s Anthony Guaimano spun in turn four for the first caution on lap three. Watsonville’s Lilly Mead spun on the backstretch for the next caution on lap five. Lemke jumped ahead by three car lengths while Reif anchored a tightly wound second pack. Deegan looked inside Reif in turn one and they tangled with Reif spinning for a lap 11 yellow flag. Deegan had to restart at the rear which changed the complexion of the race. The incident allowed Herzog, the evening’s fast-time qualifier, to restart third. Nascimento passed points leader Jesse Love IV of Menlo Park for fifth on the restart. Austin Edwards hounded Lemke up front with several bumps before cutting inside down the backstretch to challenge on lap 17. Edwards led at the line on lap 19 and brought Herzog to second. Tyler Reif spun on the backstretch for a caution on lap 21. Dylan Zampa and Kyle Keller collided for a turn four spin on lap 24. Love and Deegan worked their way underneath July winner Eric Nascimento, Jr. to drop him back to seventh. Nascimento went to the outside and tried to pass Deegan back while Love peeked inside Berry for fourth in a two-by-two formation. Herzog got around Edwards and led lap 31 with Lemke following through to take second from Edwards as well. Berry spun from fourth and Love was blocked, dropping him to the rear of the field before the caution flew. Zampa collided with Mead for a caution on lap 34. Deegan and Nascimento displayed great side-by-side action for third on the following restart as Deegan marched through the field. The intense battle for third continued coming out of the lap 50 break. Deegan finally cleared Nascimento down the backstretch on lap 55. Mead and RJ Smothermon came together on the front stretch prompting a lap 60 caution. Deegan turned up the wick to challenge her teammate Lemke for the second position which allowed Herzog to get a five car length cushion with ten to go. Lemke managed to motor away from Deegan while Austin Herzog crossed the stripe with the victory. Lemke, Deegan, Nascimento, and points leader Love were the balance of the top-five. The Modified Super Toyotas and Toyota Sedans ran a combined 30 lap feature where the top two in each respective class ran in unison throughout the race. Dave Lander led the MSTs early before a caution allowed Patrick Geiger to take over the top spot. Lander stayed in tow for the entire distance darting in and out of Sedan traffic. Lander tried one last move for the lead into turn four at the finish but couldn’t make it work. In Toyota Sedans about ¾ of a lap behind them, Dean Gould held off points leader Mike Marley in a similarly close finish. Up next for Madera Speedway is a big night this Saturday, with the 75 Lap Open Hobby Stock Race, The USAC HPD Midgets, BCRA Midgets, CSS/360 Super Modifieds, Legends of the Pacific, and the Legends of Kearney Bowl. Madera Racing on MAVTV continues every Thursday night at 8 p.m. Eastern / 5 p.m. Pacific. Madera Speedway racing is also available on the LucasOilRacing.TV app.